This is the logline for the report highlighted below: People want New Energy but they don't know how to get it and they don't know how to ask for it. The survey shows high consumer awareness of the difference between electricity generated from polluting, toxic Old Energy sources like coal and nuclear and electricity generated from this good earth's sun, wind, flowing waters and deep heat. But there appears to be less awareness of how to access such electricity. And there is significantly less understanding (and hence popular mistrust) of the concept of offsets which was developed so that spending by conscientious consumers could be channeled into the building of New Energy and Energy Efficiency infrastructure. The obvious remedy would seem to be education but that answer comes too easily. Getting a teachable moment with a public distracted by the crashing of home values, the rising of the latest television idol and the fate of the newest movie hangover is no small task. 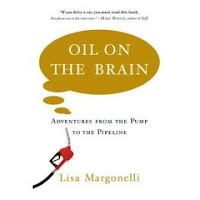 Even skyrocketing gas pump prices only produce sound and fury before the oil producers grab their profits from the global casino table, retreat until their next opportune syllable of recorded time and let the petty pace of rising and falling oil price cycles go on. This is the tragedy of the commons. Everybody knows New Energy and Energy Efficiency are the answers, just like everybody knows society's common grounds must be cared for. But it seems to be in no individual's interest to stop taking the easy way out and tend to the commons. There is, however, a way out. Does the phrase "promote the general welfare" ring a bell? That's the Liberty Bell ringing because it's the part of the preamble to the U.S. constitution, written before the Liberty Bell cracked, that calls on government to take action in situations like this. What kind of action? Simple. As the report highlighted below says, "Opportunities exist for continued market growth in renewable energy..." All government has to do is design and implement the right stable, long-term incentives to drive entrepreneurs toward the opportunities and set up rules to keep vested interests from suppressing the desire of the marketplace. 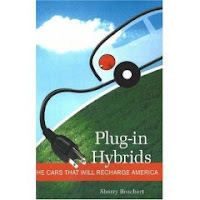 Long-term investment, production, manufacturing and alternative fuel vehicle tax credits, a national Renewable Energy Standard (RES) requiring utilities to obtain a portion of their power from New Energy sources by a designated date, a price on toxic emissions, a streamlining of permitting complexities and the opening of transmission corridors - these are not challenging concepts. They are things that would not only promote the general welfare but achieve what poll after poll shows a bipartisan majority of the voting public wants. The data in this report are taken from Natural Marketing Institute’s (NMI) Lifestyles of Health and Sustainability (LOHAS) Consumer Trends Database®. Created in 2002, the syndicated consumer database contains responses from 2,000 to 4,000 nationally representative U.S. adults (meaning the demographics of the sample are consistent with U.S. Census findings) each year. A sample of 2,000 has a confidence interval of +/-2.2 percentage points at the 95% confidence level, which decreases to +/- 1.2 percentage points with 4,000 respondents. 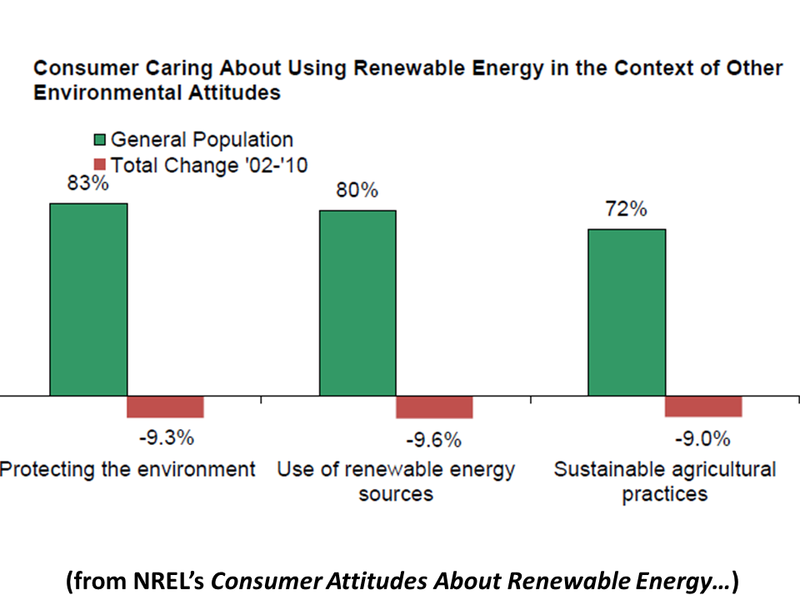 NMI used the database to analyze consumer attitudes and behavior related to renewable energy and to update previously conducted related research. Specifically, this report will explore consumer awareness, concerns, perceived benefits, knowledge of purchase options, and usage of renewable energy as well as provide regional comparisons and trends over time. 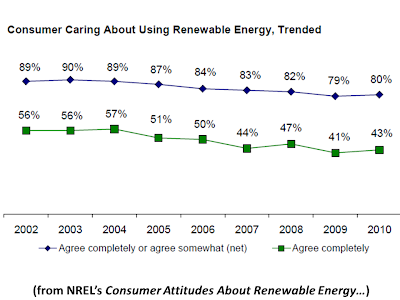 • The majority of consumers (80%) indicated that they care about the use of renewable energy. However, concern has diminished slightly over time, which is consistent with other broad environmental consumer attitudes (such as concerns related to environmental protection or sustainable agriculture). • Consumers primarily associate renewable energy with environmental benefits, despite the other potential benefits renewable energy has to offer and the recent efforts to broaden its appeal. • Consumer awareness of renewable energy purchase options remains relatively low, with approximately one in six consumers aware of the green power options provided by their electric suppliers, although approximately half of consumers have options available to them. • Consumers are more price sensitive for renewable energy than in the past, mirroring an increased price sensitivity NMI has observed across the green consumer landscape. • Despite the common perception, there are few differences in consumer attitudes across regions. However, consumers in the West are more aware of renewable energy terminology, such as renewable power and carbon footprint. 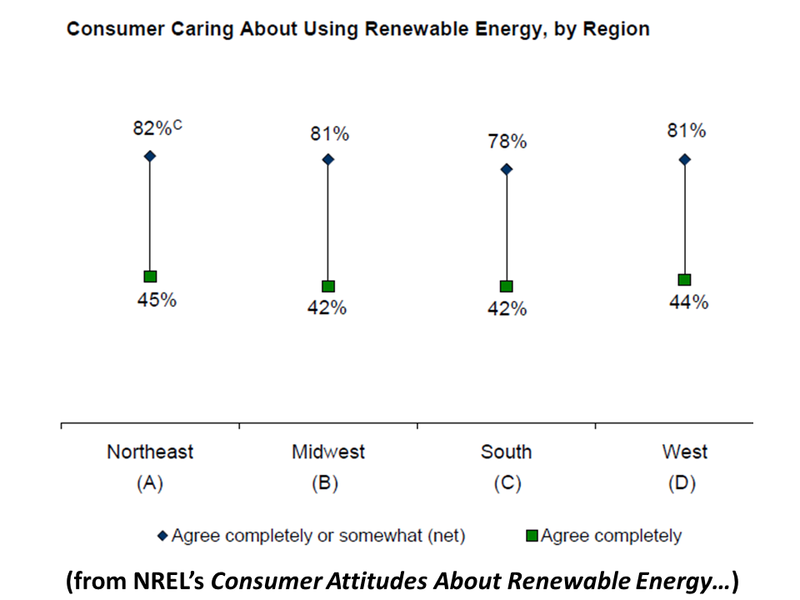 In addition, Western consumers, compared to Midwestern consumers, are more aware of their purchase options, are less price sensitive, and are more likely to have already purchased at least some type of renewable energy. 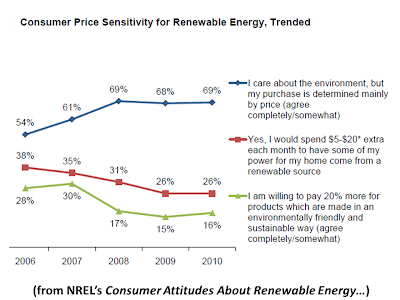 • Seven percent of the adult population reports buying at least some renewable energy for their home. According to similar research, this is a significantly lower percentage than the proportion of the population that cares about renewable energy and a higher percentage than penetration rates reported by utilities and marketers that offer renewable energy options to consumers. • Opportunities exist for continued market growth in renewable energy as indicated by the differential between concern and usage and declining premiums. 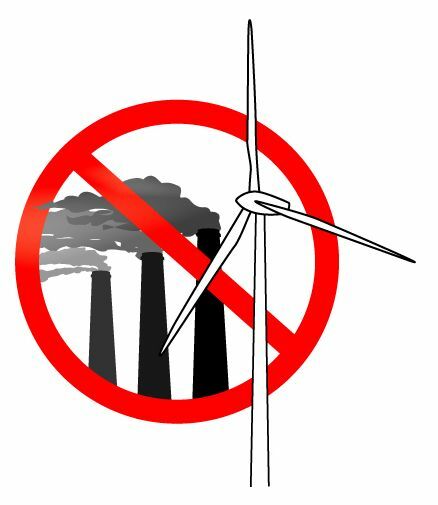 However, the modest awareness levels of renewable energy options are a challenge. The voluntary renewable energy market has grown considerably since its inception in the 1990s. In 2009, more than 30 million MWh of renewable energy were sold in the voluntary market, a nearly four-fold increase compared to 2005 and almost equal to the amount of new renewables required to meet 2009 state renewable portfolio standards. Renewable energy is available to consumers in three forms: (1) utility green pricing programs offered in regulated states, (2) competitive retail electricity products in deregulated or competitive markets, and (3) renewable energy certificates (RECs) purchased in over-the-counter transactions or through independent REC marketers. Customer participation in utility green pricing programs and competitive market programs has increased over the years, though penetration rates remain low. More than 1.4 million consumers purchase green power through their utility or retail electricity provider or in the REC market, with the vast majority (99%) of consumers purchasing through their utility or retail electricity provider. However, in 2009, the average participation rate among utility green pricing programs was 2.0%, while penetration rates in competitive markets ranged from 1.7% to 2.5%. The top 10 programs in 2009 had participation rates ranging from 5.1% to 20.8%. 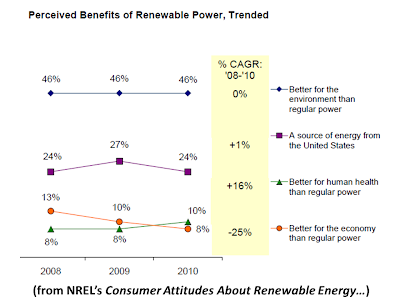 (Bird and Sumner 2010) The objective of this report is to explore trends in consumer interest and awareness of renewable energy options through analysis of historical and regional survey data. Specifically, the report provides a historical and regional analysis of consumer responses to questions that indicate how much people care about renewable energy sources, how aware they are of options to buy renewable energy, their willingness to pay for renewable energy, and their opinions on the benefits of renewable energy. Only the renewable energy data are summarized here, provided by Natural Marketing Institute’s (NMI’s) Lifestyles of Health and Sustainability (LOHAS) Consumer Trends Database, a survey instrument conducted annually since 2002 that covers a broad range of environmental issues. This report also provides an update to previously conducted research on consumer attitudes regarding renewable energy. Earlier consumer market research revealed consumer interest in supporting renewable energy. 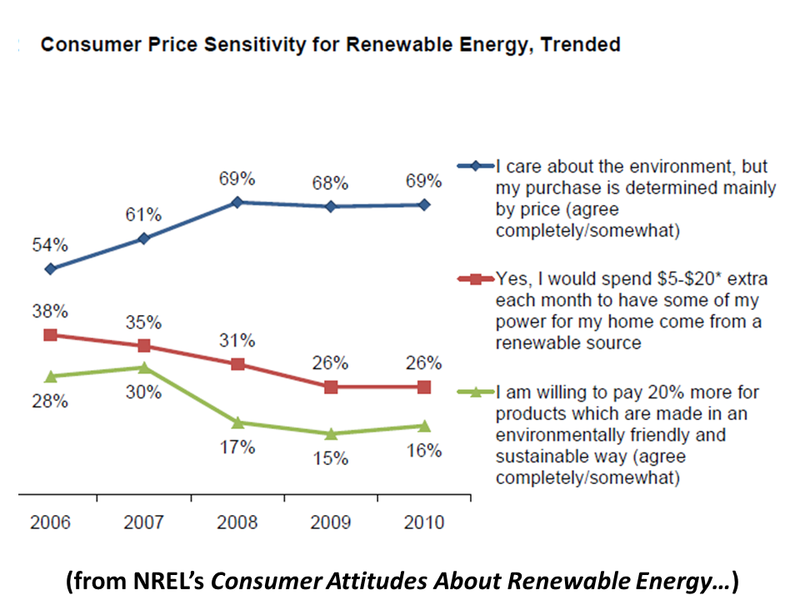 For example, utility market research on consumer preferences found that 52%–95% of residential consumers were willing to pay at least a modest amount ($3– $10) for renewable energy on a monthly basis (Farhar 1999). Deliberative polling of Texas electricity consumers also found that the median willingness to pay among consumers in various utility territories ranged from $1.50 to $6.50 per month (Lehr et al. 2003). 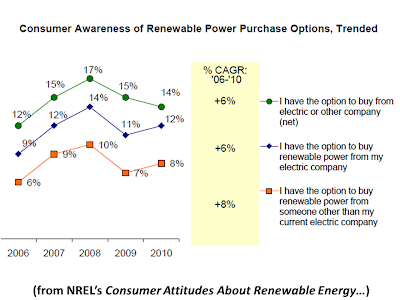 In addition, a 2007 Opinion Research Corporation poll found similar results to 2007 NMI data regarding familiarity with the term renewable energy, awareness of purchasing options, and purchase rates. The updated data on consumer attitudes and awareness presented here are useful for utilities or marketers engaged in the voluntary renewable energy market. The data on trends and regional differences in attitudes towards renewable energy may also be useful for policymakers, stakeholders, and the renewable energy industry as a whole. LOHAS describes the consumers and organizations that put health and sustainability first and foremost in their lives. NMI first designed the LOHAS Consumer Trends Database in 2002 to measure and describe the marketplace for LOHAS products and services within the total U.S. population, the consumers who use them, consumer expectations of corporate behavior, and attitudes toward environmental and social issues. Particular attention is paid to consumer attitudes, behaviors, psychographics, lifestyle activities, and product and service usage patterns in order to provide the information needed to capitalize on growing sustainability and corporate responsibility initiatives. Renewable energy has been included since the beginning of the research. Undertaken by NMI on behalf of its sponsor clients, the 2010 research was conducted in July via an online survey of 4,000 U.S. general population adults. Survey participants included those who had opted in to a panel as well as a demographically balanced, random subset of the panel. As respondents completed the survey, additional sample data were sent to provide balance demographics for any groups that were underrepresented at that point. To correct for any minor variations in the sample’s demographic characteristics and the population as a whole, the data have been post-weighted to match multiple U.S. Census demographic measures. No individual respondent’s weighting factor is greater than three or less than 0.3. The study utilized a leading online research firm and was designed, managed, and analyzed by NMI. The text of the questions used in this report is included in Appendix A. The results of this survey are nationally projectable to the U.S. adult population and statistically valid at the 95% confidence level +/- 1.2%. Throughout this report, capital letters indicate statistically significant differences between regions at the 95% confidence level using t-tests. The t-tests reflect the probability that the difference in two numbers being compared is not due to sampling error. In regional charts and graphs, each region is assigned a letter as a short-hand code. A significant regional difference is noted on the region with the higher value by referencing the capital letter of the region with the lower value. This report includes analyses by geographic region. 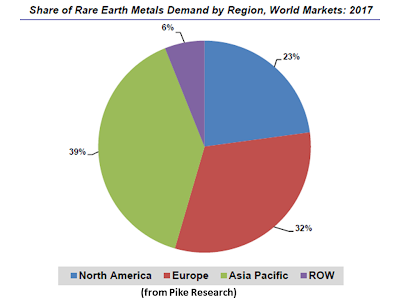 The regions are defined in Table 1 and are consistent with industry and market research standards. Generating market interest in renewable energy starts with raising awareness of commonly used terms. 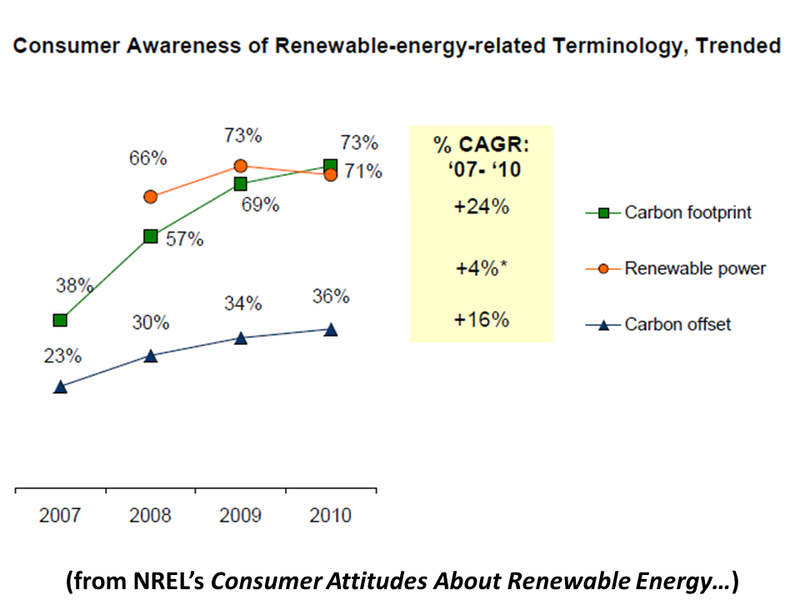 Since NMI began measuring awareness of renewable power in 2008, at least two-thirds of consumers have been aware of the term, with a statistically higher number in 2010 (as shown in Figure 1). 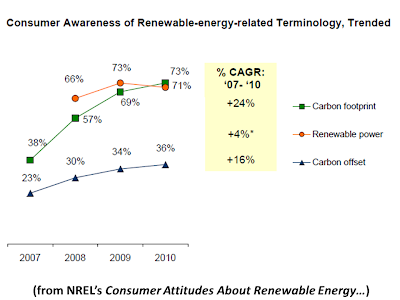 In the same timeframe, consumer awareness of carbon-related terminology has increased more rapidly. The awareness of the term carbon footprint has grown particularly quickly, up 24% annually since 2007, with most of the growth between 2007 and 2008, when media coverage of this issue was more prevalent, especially in the Northeast and West where there are established carbon regulations (i.e., RGGI in the East and Western Climate Initiative in California). As newer terms, and those commonly used by the media, many consumers have latched onto them. The term carbon offset has not seen the same dramatic increase in awareness as carbon footprint and is still below the 2007 carbon footprint awareness level. While the two terms may be clearly linked within the business community, the same cannot be said of consumers. While carbon footprints are commonly discussed in consumer media, specifically when talking about how to reduce a carbon footprint, reports often refer to energy efficiency and conservation, use of renewable energy, and carbon offsets, among other approaches. Since carbon offsets are just one of the approaches to manage a carbon footprint, it could explain why awareness of this term is lower. Interestingly, the term carbon footprint has overtaken the term renewable power in awareness. Since the term renewable power has been used for decades, it is remarkable that carbon footprint has eclipsed it after just a few years. 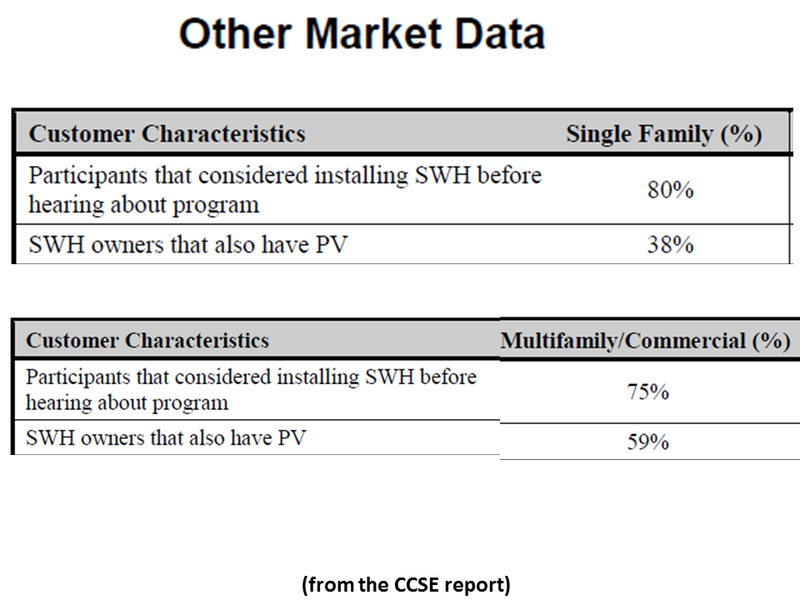 While more consumers may be aware of specific types of renewable energy, such as solar and wind (85% of consumers were aware of wind energy in 2009, for instance), perhaps the umbrella term is not as well known. Therefore, communicators in this field need to be mindful of consumer familiarity with these terms in their publications. 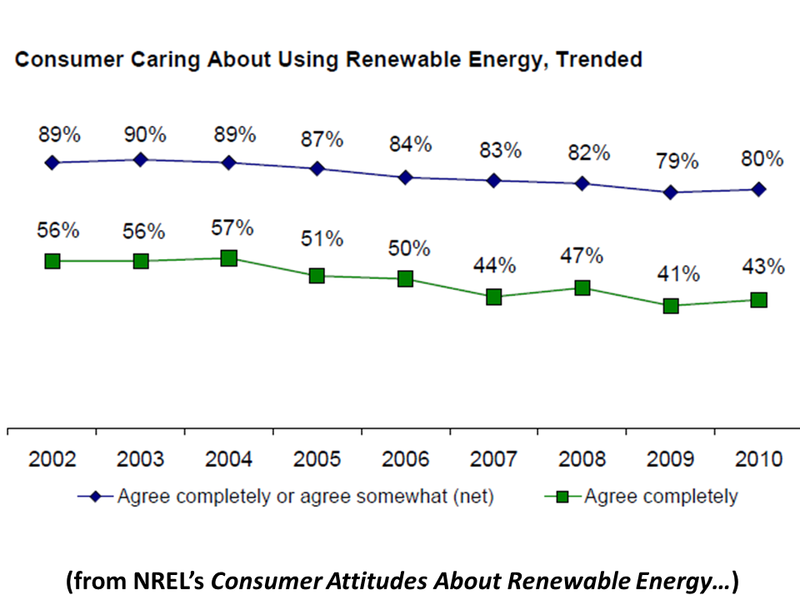 • Concern about renewable energy is quite high, with 80% of the general population caring completely or somewhat about the use of renewable energy sources. Although concern has decreased from 89% in 2002, such decline is consistent with a general decline in caring about environmental attributes, such as protecting the environment and sustainable agricultural practices. • Consumers continue to believe that the most important benefit of renewable energy is that it is better for the environment than regular power, although some consumers believe that the most important benefits are domestic sourcing and to a lesser extent human health or economic benefits. • Consumer awareness is a challenge for utilities or companies providing renewable energy options to consumers. 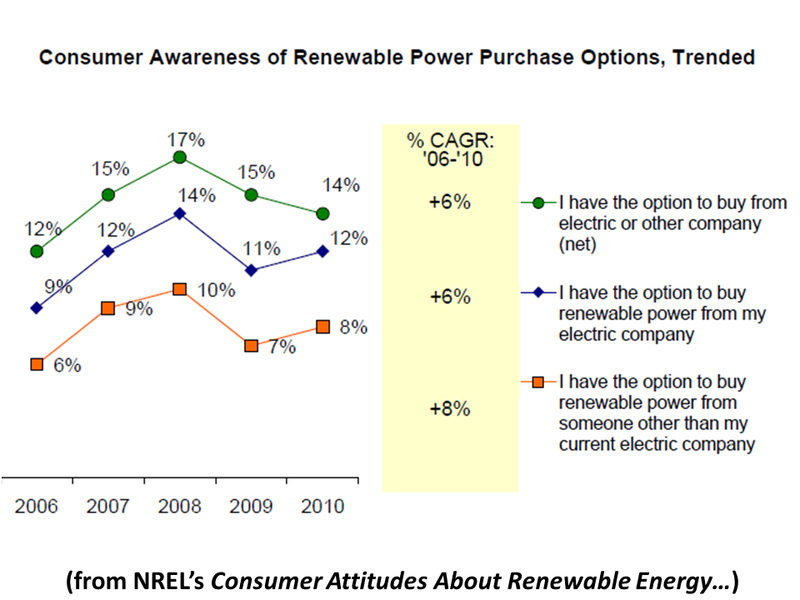 Despite a modest increase in consumer awareness, only 14% of consumers were aware of renewable energy purchase options in 2010. 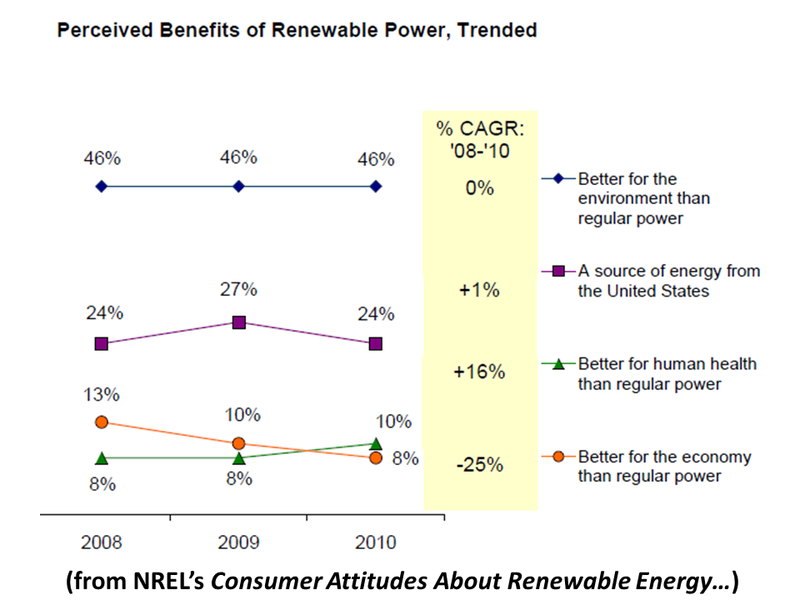 In addition, consumer willingness to pay more for renewable energy has declined in recent years. -Consumers in the West are more aware of the terms carbon footprint, renewable power, and carbon offset than consumers in other regions who have equivalent awareness. Consumers in the West are also less price sensitive than consumers in other regions and are more likely to report buying at least some of their household power from renewable sources. 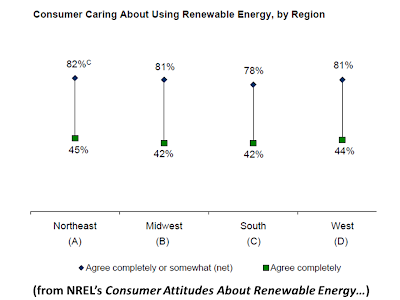 -Consumers in the Midwest are the least likely to be aware of their renewable power purchase options, while consumers in Texas and the Northeast, where retail competition exists and multiple alternative providers operate, are most aware of renewable energy purchase options. 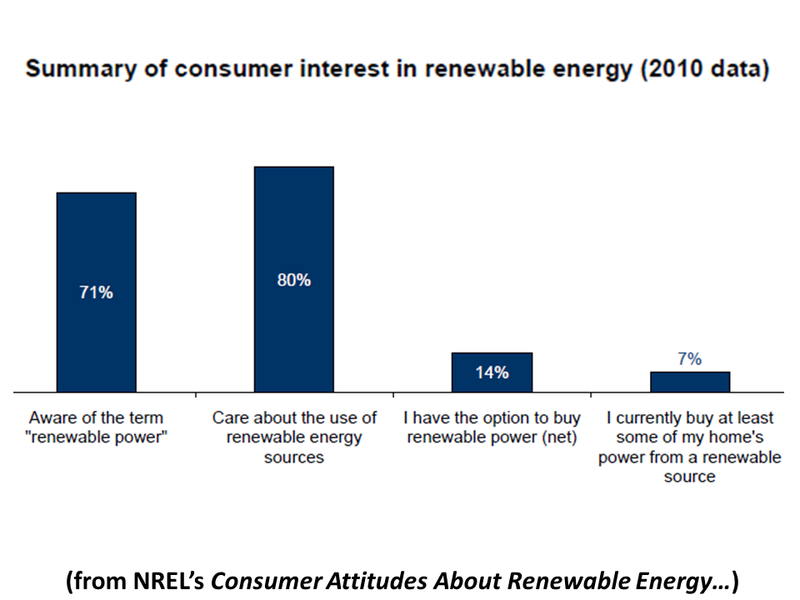 Given low levels of product awareness, and that half of consumers who are aware of options to buy renewables do say they purchase renewables, these data suggest further opportunity for market growth in this sector, particularly if heightened consumer awareness can be achieved. Distributed Geothermal in California Can Add 7% of Supply What Feed-in Tariff Prices Are Necessary? 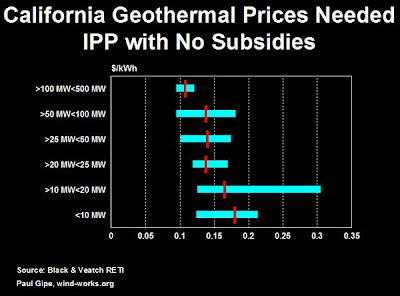 "Small, geographically dispersed geothermal power plants could provide 7% of California's electricity supply [and compliment development of more variable renewable resources as it moves to meet its new state standard requiring 33% of its electricity to come from renewable energy by including geothermal energy in Governor Brown's as yet unannounced feed-in tariff policy]…Geothermal energy is a renewable resource using the heat of the earth to generate electricity and heat homes, offices, and factories. "California leads the world in geothermal energy development. However…[t]here has been very little geothermal development in the state since… the early 1980s…Renewable Energy Transmission Initiative (RETI), [a 2008 engineering consultant Black & Veatch study, detailed] the cost to develop 244 proposed geothermal power plants at sites [from 8 MW to 1,000 MW] in California, Nevada, Oregon, Idaho and British Columbia…"
"Projects less than 50 MW would account for 40% of all proposed geothermal generating capacity, some 3,300 MW. These plants would produce 40% of all potential geothermal generation, about 22 TWh per year (7% of current supply) or 1.7 times more electricity than at present…"
"While federal investment subsidies currently exist in the form of the PTC and ITC for many renewable energy technologies, their future is uncertain…[and] investors are wary of financing projects when the future of tax credits or other "incentives" is questionable…For IPP projects without access to federal subsidies, tariffs for geothermal projects less than 20 MW in California would…[run] from a low of $0.13/kWh to as much as $0.30/kWh. Tariffs for projects from 20 MW to 50 MW would vary from a low of $0.10/kWh to a high of $0.18/kWh…Projects that could be developed quickly and take advantage of the federal ITC while it remains available would be significantly less expensive…For projects less than 20 MW, tariffs would vary from a low of about $0.09/kWh to a high of $0.20/kWh. 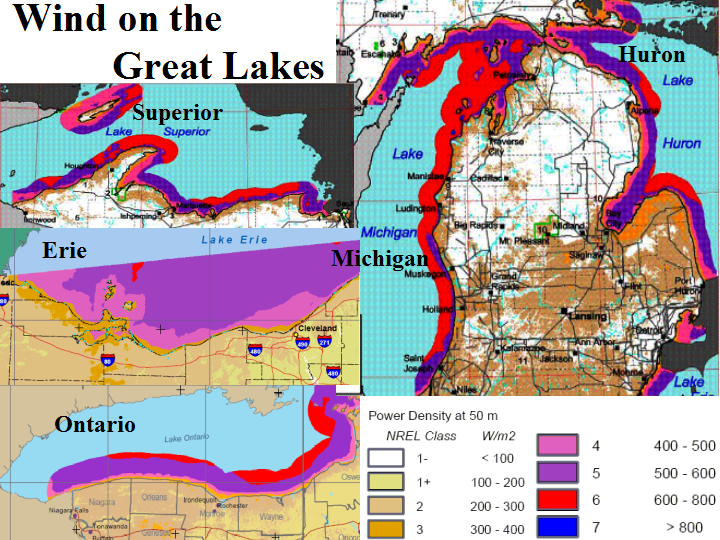 Projects from 20 MW to 50 MW in size would require tariffs in the range from a low of $0.08/kWh to $0.13/kWh…"
"Fresh water ice, reluctant residents, and a dearth of vessels conspire against…[development of] the Great Lakes’ whopping offshore wind potential…But where many before have tried and failed…[The Lake Erie Energy Development Corporation (LEEDCo)] has taken a pragmatic approach…Working closely with residents, publicly elected officials, and local businesses, LEEDCo has identified a pathway for rolling out a socially acceptable, financially viable, local economy-boosting offshore wind programme in Lake Erie." Dr Lorry Wagner, president, Lake Erie Energy Development Corporation (LEEDCo): "...We could be described as a pre-developer…[I]n Ohio, much of the offshore wind development planning has been based on monthly meetings with stakeholders since 2006. 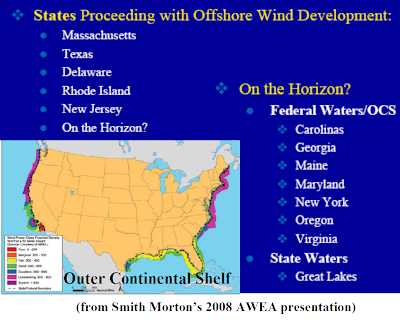 Stakeholders here in Ohio are generally supportive of offshore wind…[W]e learned from…the UK’s Round 1, where organizations paid close attention to the key issues that were raised…[and from] the top-down approach taken in Michigan, Canada and New York State, where developers and/or the government announced their intention to build massive gigawatt projects without prior consultation. 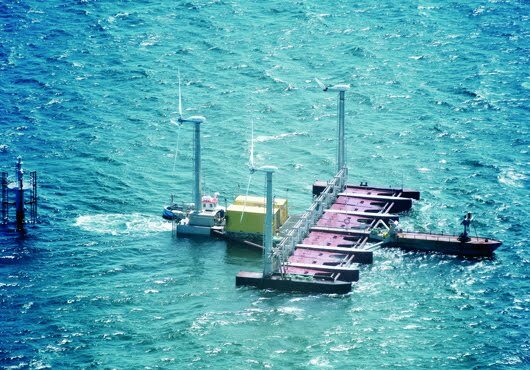 People don’t like [that]…"
Dr Lorry Wagner, president, Lake Erie Energy Development Corporation (LEEDCo): "...Lake Erie is pretty shallow and for the pilot we are building in water depths of 19 meters. For the rest of the project the water depth will be less than 25 metres. 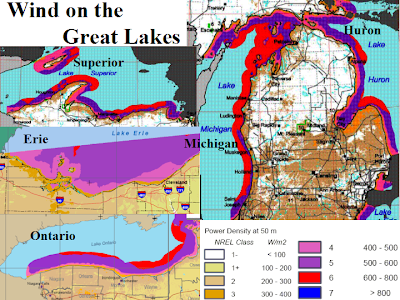 The lakebed soil is a combination of glacial till (clay rubble and muck) and then bedrock…[I]t is unlikely that monopiles will be cost effective…[T]he leading candidate is a gravity base foundation… [F]our innovative foundations designed to reduce costs [are possibilities]…"
Dr Lorry Wagner, president, Lake Erie Energy Development Corporation (LEEDCo): "...We are collaborating with the Cold Regions Laboratory of the US Army Corps to understand [freshwater] ice load and forces and European design of foundations for icing and how to optimise that design to be more cost effective…The traditional (sea water) solution uses an ice cone at the water line to avert pressure from the ice. 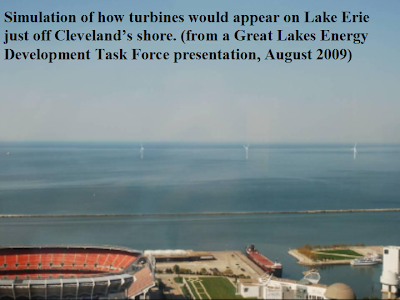 So we’ll begin with something traditional and model with turbine simulation software to optimize…"
Dr Lorry Wagner, president, Lake Erie Energy Development Corporation (LEEDCo): "...[To build 1 gigawatt of offshore wind in Lake Erie, we] need purpose-built vessels in the Great Lakes…Another challenge is the port facilities…[T]he industry will probably be served by multiple ports…[W]e are hopeful that the Canadians will come onboard on both building a grid and building vessels…North to South, it is only 45 miles…Most projects will be 10-20 miles out, so they will virtually be back-to-back…At one time, there was a proposed 1000 MW cable between Canada and Pennsylvania…"
Dr Lorry Wagner, president, Lake Erie Energy Development Corporation (LEEDCo): "Over the course of the next five years [the obstacles] will get sorted out…The Great Lakes are huge and Lake Erie itself is quite large; if the whole lake could be developed it has the potential for more than 60 gigawatts…The other Lakes have even more potential…"
"San Diego Gas & Electric (SDG&E) and subsidiaries of Soitec Solar Development, LLC, a renewable energy company managed by Soitec (Euronext Paris)…[signed] two additional 25-year contracts for a total of 125 megawatts (MW) of solar energy to be generated in the utility’s service territory. The energy will be produced using Soitec’s Concentrix™ concentrator photovoltaic (CPV) technology with solar modules manufactured in a new Soitec factory to be built in the San Diego area. "These new agreements are separate from the three San Diego contracts the two companies signed in April for 30 MW of CPV-generated solar power. Combined, the five contracts…represent five separate projects capable of generating a combined total of 155 megawatts of clean, renewable solar power, or enough energy to supply more than 60,000 homes. Both of the new proposed projects will be located in San Diego County and will be situated near SDG&E electric substations…"
"Soitec’s new manufacturing facility will have an annual production capacity of 200 MW and will supply all of SDG&E’s projects with Soitec’s exclusive Concentrix CPV technology, which produces power at a much higher efficiency relative to standard solar panels. At full capacity, Soitec’s San Diego operations facility will generate up to 450 direct jobs and more than 1,000 indirect jobs. The factory location is expected to be announced this summer, with completion within 18 months of construction start…"
"A gravity-defying leap in the price of Chinese rare earth metals has triggered fears that the cost of components used in a range of goods from mobile phones to hybrid cars could soar…The three to fivefold jump in prices since January comes after China, the world’s biggest producer of rare earths, has clamped down on domestic output. "The implications could be far-reaching. 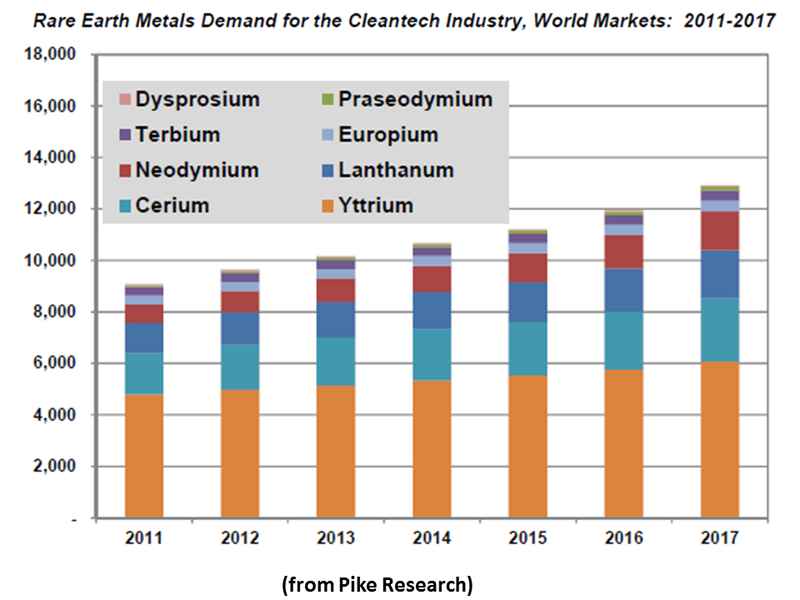 Although annual consumption of the metals is small relative to that of other commodities, rare earths are found in everything from fluorescent lights to wind turbines. They are very difficult, if not impossible, to substitute." "Rare earths came under the spotlight after China, which produces more than 90 per cent of the world’s total output, started to reduce export quotas two years ago. Beijing’s influence aroused concern when exports of rare earths to Japan were temporarily suspended after a diplomatic dispute." 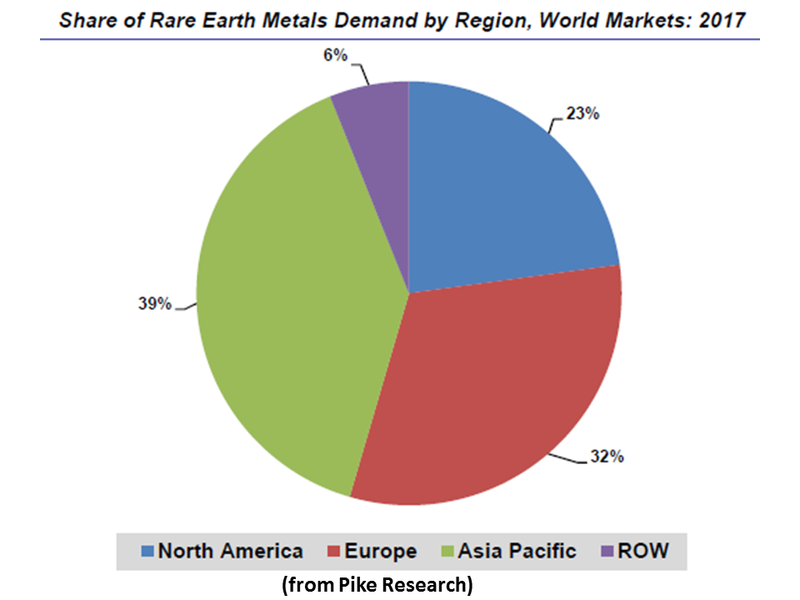 "In the face of concern from industry and from global capitals, China has insisted that it will continue to be a reliable supplier of rare earths. However, rising prices fit neatly with China’s ambition to end its role as supplier of cheap rare earths to the world…"
Without meaning to detract from the heroic American men and women who have stood up for and go on standing up for freedom and the right of free expression, it is worthwhile remembering today that, as outlined in the guest post below, there is another kind of war going on that the people of this good earth are slowly winning. This war doesn't get the headlines other wars get, it isn't led by a pentagon full of four-star generals and the warriors on the front lines only wear deep commitment as a uniform. But more victims fall to coal's weapons of mass destruction day in and day out than fall to terrorism, and winning this war will surely mean at least as much as victory in more well-publicized struggles, and those on the front lines also deserve to be celebrated as heroes. In the United States and Europe, the triple whammy of recession, cheap alternatives, and aggressive anti-coal campaigning has helped halt the expansion of coal use. Since 2004, plans to build more than 150 coal plants in the U.S. have been abandoned. In fact, the U.S. Energy Information Administration (EIA), a government agency that analyzes energy-related statistics, predicts continued stagnation or decline in coal-fired electricity generation in the U.S. and the European Union over the coming decades. Facing resistance to its longstanding rule in the Organization for Economic Cooperation and Development (OECD) countries, King Coal has redoubled ambitions elsewhere. According to 2010 projections by the EIA, coal consumption in the non-OECD world will increase by 23 quadrillion BTUs between 2007 and 2020. That's roughly the equivalent of today's entire U.S. coal-mining and coal-power sector, or approximately a thousand coal-fired generators, each 300 megawatts (MW) in size, spewing toxic chemicals into the environments and lungs of surrounding communities, and an equal number of million-ton-per-year coal mines. While China struggles with the enormity of the pollution burden from its world-leading annual coal consumption, it is not the only hotbed of future coal-plant construction. Activists in India, for example, report that regulators gave the green light to at least 173 coal projects during 2010 -- nearly one plant every other day. In Southeast Asia, large Chinese utilities such as China Huadian are setting up shop to finance and build a slew of new coal plants. Meanwhile, new coal mines are being proposed in Australia and Indonesia, overwhelmingly for export sales. Countries from Mozambique to Mongolia, which have had little domestic need for coal, are now being hyped as the next big players in the global coal rush. In the fertile farming areas that support large rural populations in much of Asia, the new coal boom spells civil conflict, as fields are seized, villages are ordered to pack up and leave, and communities resist. For the U.S. coal movement, the 2,500 people who turned out to protest the Capitol Power Plant was a large number. 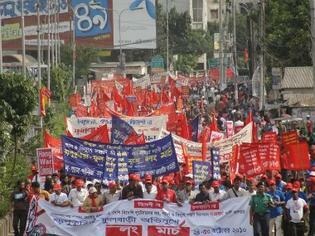 In India or Bangladesh, marches and demonstrations of more than 10,000 people are not uncommon. The dominant international narrative focuses on the need to build large numbers of new coal plants across the developing world to spur economic progress. 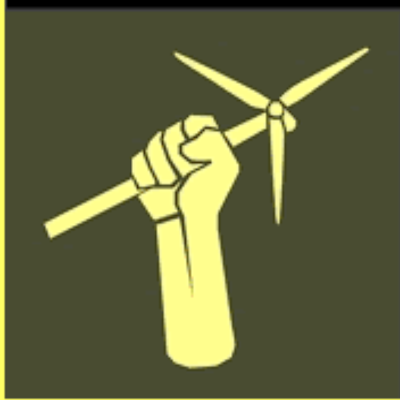 However, the assertion that development can only be achieved through a massive expansion of coal use is being met with increasingly fierce resistance by those asked to bear the most toxic and destructive burdens of this expansion: the people living next to coal projects. Local populations are resisting private and public-sector pressure to dramatically expand coal-fired power because these projects are not intended for their benefit. While local people face displacement and the destruction of their livelihoods, electricity is often exported to urban centers. Communities are calling for a more sustainable model of energy development that prioritizes access to energy services for all, environmental sustainability, and human health. Their efforts to halt coal-plant construction have placed them front and center in the struggle over energy and development in the 21st century. In the past, most communities struggling to take on ill-conceived projects have done so largely on their own, but that's starting to change. International coalitions are beginning to develop to bring publicity and support to front-line efforts. Here are a dozen places around the world where people are uniting to halt coal projects, increasingly with international support. In April, 1,500 people convened on a beach in Malaysia to savor a victory that had been judged impossible just two years earlier: the defeat of a 300-MW coal plant in the Malaysian state of Sabah, located on the northeast side of the island of Borneo. Celebrations were also underway 7,500 miles away, in California, among a group of activists who had helped draw international publicity to the issue -- including a Time magazine article entitled "A Coal Plant in Paradise." The Malaysian group LEAP (Land Empowerment Animals People) helped forge the coalition of Malaysian NGOs, grassroots communities, and citizen movements, and generate support from the U.S. and other parts of the world. Along with LEAP, the coalition included World Wildlife Fund for Malaysia, Malaysian Nature Society, Partners of Community Organizations Trust, and the Sabah Environmental Protection Association. Among those providing overseas support were 350.org and Mongabay, which worked to publicize the project, and Daniel Kammen of UC-Berkeley and the World Bank, who coordinated a comprehensive energy analysis proposing clean energy alternatives to coal-fired power in Sabah. Bangladesh's high population density (more than 164 million people in a country the size of Iowa) and rich agricultural land make coal mining a destructive proposition. In the township of Phulbari, as many as 220,000 people would be displaced by a proposed 15-million-ton-per-year coal mine and a 500-MW coal plant. Community opposition reached a crescendo in 2006, when paramilitary forces fired on a protest rally of as many as 70,000 people, killing three people and injuring 200. In the wake of these deaths, nationwide protests and strikes closed down the country for four days. They were brought to an end only when the government signed an agreement to ban open-pit mining and permanently expel the project's London-based financier, Asia Energy Corporation (now Global Coal Management Resources Plc or GCM). Although demonstrators burned down the company's project information office and its personnel were forced to flee the country, GCM has since returned, with backing from New York-based financier Christian Leone and U.S Ambassador James Moriarty. During recent demonstrations, the Bangladeshi government has deployed its Rapid Action Battalion, notorious for torture and for the deaths of persons in its custody. The repression has failed. In October 2010, tens of thousands of people joined a 250-mile march from the capital of Dhaka to the town of Phulbari. The coalition opposing the mine has grown to include groups from across the spectrum of Bangladesh's civil society, as well as international groups. The San Francisco-based International Accountability Project is involved in coordinating overseas support and outreach. This coastal state of eastern India is experiencing a coal-plant construction boom, including the 4,000-MW Krishnapatnam Ultra Mega Power Project, one of nine such massive projects in planning or under construction across the country. (By comparison, the largest coal plant in the United States, Plant Scherer in Georgia, is 3,564 MW.) Residents have resisted the siting of large plants in densely populated and ecologically sensitive agricultural districts. The 2,640-MW Sompeta plant proposed by Nagarjuna Construction Company and the 2,640-MW Bhavanapadu plant proposed by East Coast Energy have both provoked large nonviolent protests that have ended in police attacks, including four deaths of local residents. Following coverage of the police action on Indian television, investigations revealed a pattern of "crony capitalism" among the permitting agencies and corporate sponsors. As of May 2011, the Sompeta plant had been cancelled and the Bhavanapadu plant had been placed on hold by officials, with corruption investigations continuing. However, the sponsor of Sompeta, Nagarjuna Construction, is now initiating a 1,320-MW plant elsewhere in Andhra Pradesh. In Dawei, on the beautiful southern peninsula coast of Burma, Italian-Thai Development Plc signed a deal in Nov. 2010 to build a 4,000-to-6,000-MW coal plant, the largest in Southeast Asia and possibly the world. Within weeks of the signing, 19 villages had received orders to move. Dawei is 10 miles from Maungmagan, a scenic beach and rich fishing district. Burma is an authoritarian state where land displacements occur by edict and activism carries heavy risks. Yet despite the repression, grassroots action has been effective, such as in 2001 when villagers in the town of Tachilek organized protests and blocked trucks delivering construction equipment, forcing the cancellation [PDF] of Golden Triangle's coal plant. On Feb. 24, 2011, 10,000 people formed a human chain in this province in Thailand to protest a coal-fired power plant planned by Electricity Generating Authority of Thailand. This protest followed a decade of organizing and protesting by the Eastern People's Network focusing on the coastal Thai town of Rayong. The protests delayed operations of the massive Map Ta Phut industrial park, including a 1,400-MW coal plant. Home to 112 million people, this state in western India is building a concentration of large coal plants on a tiny sliver of land south of Mumbai known as the Konkan Coast (dubbed "the California of Maharashtra"). As much as 35,000 to 50,000 MW of generating capacity is on the drawing board. Concerned by the pollution and displacement entailed by the massive proposals, farmers have targeted some of the largest projects. One of these is the 4,000-MW Girye Ultra Mega Power Project, which prompted mango farmers and others to stage marches, hunger strikes, and other nonviolent actions. They successfully forced the project to seek a new location [PDF] as protests barred the government from acquiring the needed land. Other projects facing local resistance include the 1,000-MW Mauda power station and the 1,200-to-1,800-MW Shahapur Thermal Power Project. 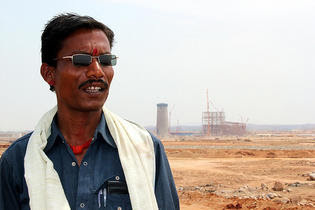 In this state on the eastern coast of India, the scale of coal-plant development is staggering. As much as 58,000 MW of projects are in the works, including three 1,800-MW coal plants under development by KSK Energy Ventures and the 4,000-MW Sundargarh Ultra Mega Power Project being planned by National Thermal Power Corporation. Ranjan Panda of Water Initiatives Odisha says that this level of coal development would require a minimum of 2,297 million cubic meters of water per year, enough to meet the domestic water requirement of close to 210 million people. In March, activists from across India converged on Orissa for a national conclave to plan a response to the coal boom, as well as the related issues of energy use and climate change. The mobilization includes the National Alliance for People's Movements, Focus Odisha, and numerous other groups. Since 1977, when the World Bank financed the first coal-fired plant in the region, the Singrauli district of this state in central India has been notorious for roughshod development and population displacement. Now more massive coal plants are being built or planned. They include the 3,960-MW Chitrangi Power Project, the 3,960-MW Sasan Ultra Mega Power Project (which is getting nearly $1 billion in financing from the U.S. Export-Import Bank), the 1,200-MW Mahan Super Thermal Power Project, the 750-MW Hindalco Captive Power Project, the 1,320-MW Nigrie Thermal Power Project, the 2,690-MW DB Power (M.P.) Limited Project, and the Vindhyachal Stage-4 Project, which will add an additional 1,000 MW to an existing 3,260-MW power station. The concentration of power generation in an agricultural area has left local communities reeling. The Sasan Ultra Mega Power Project, for example, has displaced 6,000 people. One man is benefiting: Mukesh Ambani, the controlling owner of India-based Reliance Power, whose reported net worth of $27 billion makes him one of the world's five richest individuals. On a tonnage basis, Australia already leads the world in coal exports, and that lead may widen significantly if several massive mines are allowed to move forward in the eastern coal-mining states of Queensland and New South Wales. Australia is undergoing a "coal rush" with more than 100 new projects or expansions in planning, including a number of mega-projects such as the 60-million-ton-per-year Carmichael mine by India-based Adani Group and the 30-million-ton-per-year China First mine proposed by billionaire Clive Palmer. Farmers and ranchers are fighting back with a concerted effort to protect rich agricultural lands and precious water resources from mining operations. Environmentalists are challenging numerous projects in the courts and have staged colorful direct action, such as a creative blockade of the port of Newcastle. While the low-quality coal in this state in southeastern Australia is not suitable for export, it provides 91 percent of the fuel used for power generation in Victoria itself. Last year, Environment Victoria and other groups came close to shutting down the aging Hazelwood Power Station, the second largest source of carbon pollution in the country, after commitments by Victoria Premier John Brumby to begin a staged retirement of the plant. The narrow victory of the Liberal-National party in Nov. 2010 dashed hopes for near-term action on the plant from the state government, though the federal government is now exploring linking closure of the plant to the price on carbon. Activist attention has also shifted toward preventing the construction of the proposed Dual Gas Power Station, which would burn a combination of brown coal and natural gas. One of the oldest examples of citizens working across national boundaries on coal issues is the coalition of human rights and labor organizations that has brought attention to the massive mines in Colombia, such as the 35-by-5-mile Cerrejón coal mine, operated by Cerrejón Coal Company, and the mines operated by Drummond. The expansion of these mines has been marked by paramilitary violence, high numbers of deaths in mining accidents, and displacement of entire communities, including Tabaco, a 700-person Afro-Colombian village that was razed in 2001. Witness for Peace has brought members of Kentuckians for the Commonwealth to visit the mines, as well as people who live near the Salem Power Station in Massachusetts, which uses coal from Colombia. In the Philippines, grassroots protests against new coal plants and open-pit coal mining have taken place across the country. 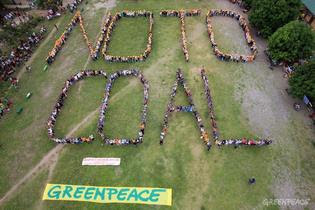 In the coastal town of Maasim on the southern island of Mindanao, local fishermen organized a flotilla of outrigger boats in Nov. 2010 to protest the proposed 200-MW Kamanga power station, while 800 people formed a human banner spelling out "No to Coal" on the grounds of a local elementary school. Supporters of the efforts included the local Catholic church, leaders of indigenous groups, foreign divers, and Greenpeace. At a separate demonstration, students at Mindanao State University dressed as Na'vi from the film Avatar marched on the fenced property of the proposed plant site. In April 2011, South Cotabato province, also on Mindanao, adopted an ordinance that would ban open pit mining in the region. As grassroots resistance grows in countries around the globe, a nascent, interconnected, worldwide anti-coal movement is emerging. In an increasingly globalized world, local campaigns can quickly reach a global audience and tap into previously unimagined support networks. While the participants in this new movement are diverse, some of the patterns are becoming clear: sustained and passionate grassroots activism is challenging the idea that fossil fuels are the only option. Many governments have backtracked or shelved plans in response to political pressure or legal actions. Some banks, investors, and even energy companies are growing increasingly wary of further supporting coal. But it's still too early to write the obituary for King Coal. The industry is now attempting to wrap itself in the cloak of "development," justifying dirty energy projects in the name of providing energy access for some of the world's most economically poor countries. While many coal projects have encountered strong opposition, too many others are proceeding without challenge. Yet those who are pushing coal projects are increasingly being seen in much the same light as tobacco-industry executives. Like tobacco, coal insinuated its way into our lives delivering a cheap, short-term energy high, but leaving a bitter long-term aftertaste -- in the case of coal, ruined rivers and lands, lives wrecked and cut short, abandoned communities, and an increasingly polluted and potentially unlivable atmosphere. We need clean energy alternatives, not the continuation of dirty energy that destroys people's health, livelihoods, and resources. Will you join the growing global movement to move away from coal? 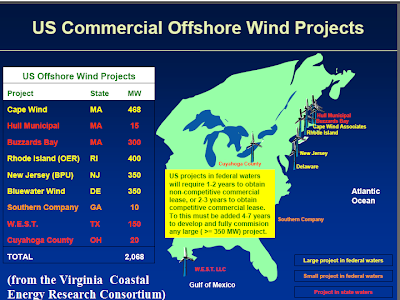 "The regulatory process for gaining the necessary approvals to construct and operate wind farms in federal waters generally three miles or more from shore has been slow to develop. However, the DOI and BOEMRE have recently taken steps to revamp and implement new permitting and leasing procedures to streamline and speed up the overall process." "The most significant change in the federal review framework was implemented…as part of a broader effort by the Obama administration to expedite deployment of renewable resources on federal lands. 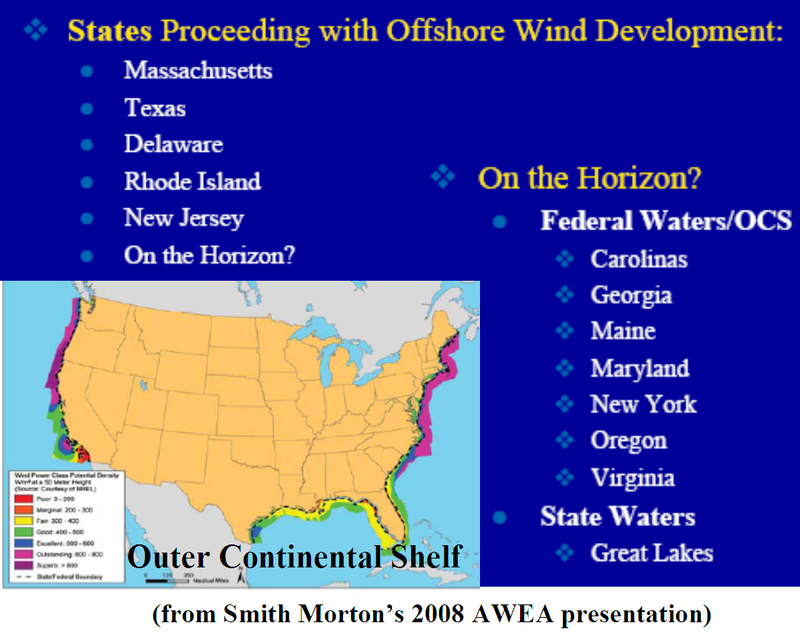 "…DOI adopted a new, streamlined approach to lease issuance by deciding to identify potential lease areas, known as wind energy areas (WEAs), and to issue leases in the WEAs upon BOEMRE's completion of regional environmental assessments (EAs) under the National Environmental Policy Act (NEPA), a far less time- and resource-intensive process than developing full-blown environmental impact statements (EIS)." "As a new industry in the U.S., the offshore wind industry faces many challenges, but with increasingly bold and decisive leadership at the federal level, the complex permitting process is becoming more streamlined, which will significantly reduce the regulatory burdens and associated risk of developing the first offshore wind projects in the U.S…"
"The pumped-storage hydropower scheme would [reportedly] use tidal power devices, with an estimated combined capacity of about 3-MW, to power a system that would pump sea water into a land-based reservoir before releasing the water through at least one hydro turbine…The pumped-storage scheme would supply an estimated 90 percent of the island's power demands." "The Channel Islands are an archipelago of British Crown Dependencies in the English Channel, off the French coast of Normandy. "Recently, ARE signed an agreement to lease a site near Braye Harbour, Alderney, as the site of the turbine pump house and reservoir…[The company has begun an environmental impact assessment to obtain marine consent from the Alderney Commission for Renewable Energy…[and their] project could [reportedly] be completed by 2012…"
"The California Solar Water Heating Pilot Program, which operated in the San Diego area during 2007-2009, helped drive a statewide program for rebates for solar thermal applications, according to a new report from the California Center for Sustainable Energy (CCSE). CCSE administered the pilot program for the California Public Utilities Commission (CPUC). "More than 340 residential and commercial solar water heating systems were installed in the San Diego region during the 30 months of the pilot program, with rebates totaling nearly $540,000. Funding for the rebates came from the CPUC and utility ratepayers statewide." "Based on the success of the pilot program, the CPUC established a statewide solar water heating rebate program under the California Solar Initiative (CSI) called CSI-Thermal in January 2010. The commission allocated $350.8 million, with the goal of installing 200,000 systems in the state by 2017. CCSE administers the CSI-Thermal program in the San Diego Gas & Electric service territory. 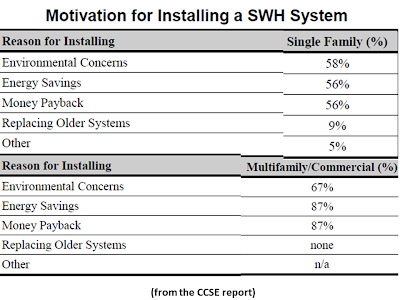 "In addition to providing rebates of up to $1,500 for residential solar water heating systems and $75,000 for commercial installations, the pilot program was designed to gather data to evaluate the effect of incentives on the adoption and marketing of the technology…"
"The report shows that single-family homes that installed solar water heating experienced an average monthly utility bill savings of $11.29 for displacing natural-gas water heating and a savings of $41.08 when displacing electric water heating. 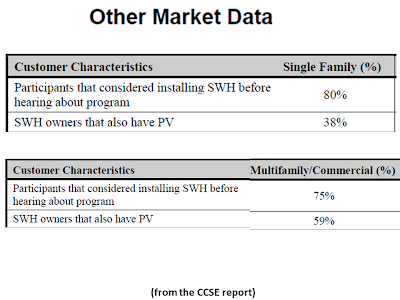 "The report also found that single-family participants appeared to be driven to install solar water heating slightly more by environmental concerns, whereas commercial/multifamily residential owners were driven mostly by financial interests. 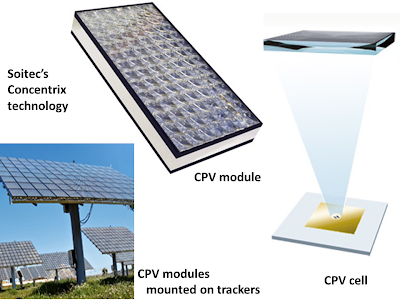 Increasing energy costs, concerns about greenhouse gas emissions and improved technology were found to be contributing factors…One of the major conclusions was that solar water heating and solar photovoltaic generation, in combination, offers a faster path toward a true zero-energy home…"
"The 1.6-100 machine combines the proven performance of GE’s 1.5-megawatt wind turbine series, known as the industry workhorse, with certified components from the advanced technology of its 2.5-100 wind turbine. With blades that extend 100 meters—a height of 33 stories—the 1.6-100 has the ability to capture additional energy, making it well suited to a variety of wind farm locations…[It has] the highest capacity factor in its class…"
"The 1.6-100 wind turbine offers a 47 percent increase in swept area over previous models, resulting in a 19 percent increase in annual energy production at 7.5 meters per second. This allows for the turbine to deliver IEC Type Class II performance while operating in a Type Class III (low wind) environment. GE has been operating a prototype 1.6-100 wind turbine at its Tehachapi, Calif., site since February of this year. "GE’s latest wind turbine technology already has been chosen for multiple projects in the United States and in Latin America. 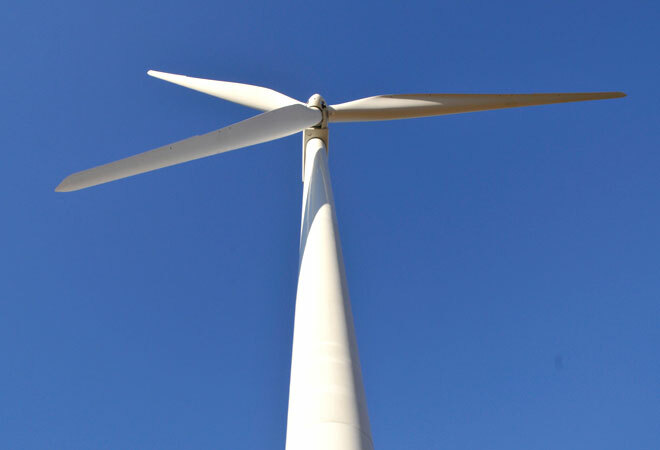 Invenergy, the largest independent wind power generation company in the United States, has initially made commitments for 233 of the 1.6-100 wind turbines for three of their projects in the Midwest United States. This will provide 372.8 megawatts of power to the U.S. grid by 2012." 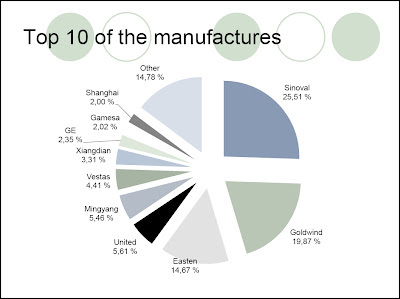 "GE’s current product portfolio includes wind turbines with rated capacities ranging from 1.5 to 4.1 megawatts and support services ranging from remote monitoring and fault resolution to complete operations and maintenance support…"
"By 2020, the Chinese government plans to generate 15 percent of the nation's total energy consumption…[from renewables] such as wind and solar power…[China] is the largest wind power market in the world, but this rapid growth is experiencing a backlash…[T]he country is now imposing new quality standards to weed out smaller companies whose products have suffered from quality control, and [concentrate] manufacturing in larger, more established firms. 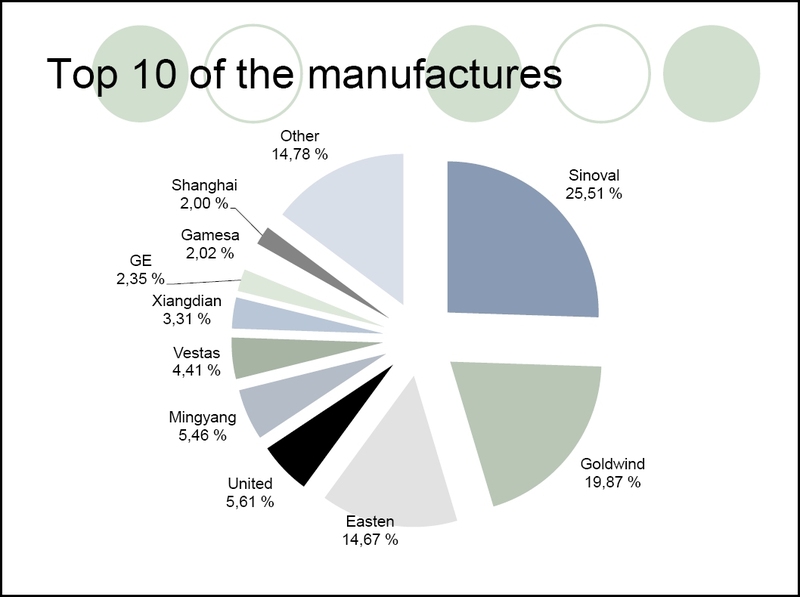 "…European manufacturers that entered the Chinese wind power market…have not generated the revenues they had hoped…largely due to the China's strict local content rules that require 70 percent of all components be manufactured by its domestic supply chain…[F]oreign manufacturers [are trying] to balance the pros and cons of doing business in a market that is clearly tilted toward maximizing returns for China - and not foreign international corporations…"
"In 2010, China increased its total wind power capacity to 41.8 GW, up 62 percent from the previous year. However, for the first time since 2005, growth in wind power is slowing down in China because… China used Germany's feed-in tariffs and mandatory grid access as a model…[but] its laws have never been enforced…[and] it is estimated that approximately 30 percent of China's installed wind capacity has yet to be connected to the grid… Many PPA's signed in China contain grid curtailment provisions that lack compensation, reducing expected profits…[and, 3] Subsidies have been paid out every six months, creating cash flow issues for developers…[making] it particularly difficult to finance projects in China when depending upon international sources of credit. "There is a striking lack of coordination between different provincial government actions and the central government. While such bureaucratic matters are not unique to China, the country's inexperience in managing such large portfolios of variable renewable generation raises questions about the sustainability of the world's hottest market…"
"Unlike other successful Chinese wind turbine companies - such as Sinovel Wind Group - Goldwind is looking well beyond China's borders for business opportunities and has launched a joint venture in the United States…[It] installed its 1.5 MW turbine in Pipestone Town, Minnesota and has also signed a contract for a larger turbine delivery project (>106 MW) in Shady Oaks, Illinois." "A sudden slowdown in completed installations due to the halting of the Italian market, as well as a slower than expected start to the year in other key European markets, has led to a sharp increase in stock levels throughout the supply chain. 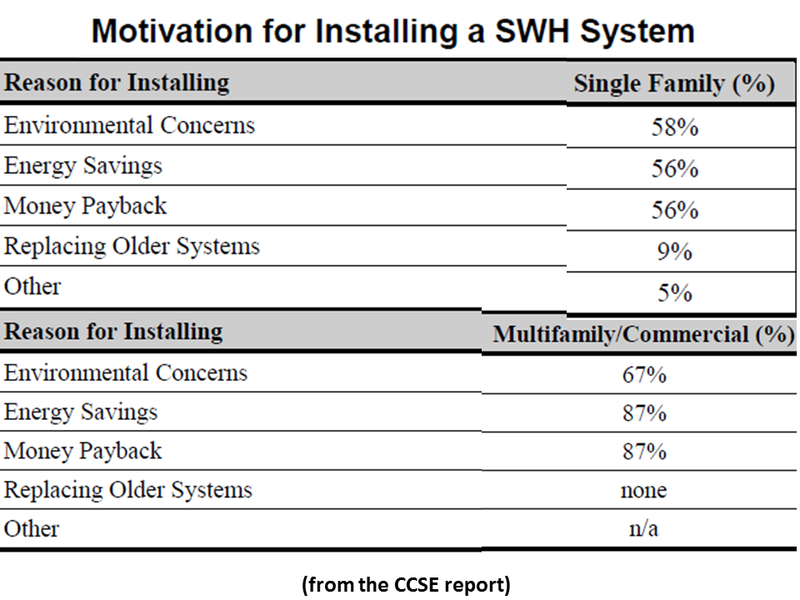 Inventory levels at manufacturers, distributors, integrators and installers have all climbed during the first half of 2011." 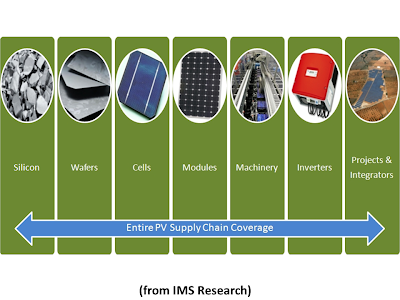 "Most of this record inventory has already been shipped by module manufacturers and is located in distribution and sales channels. 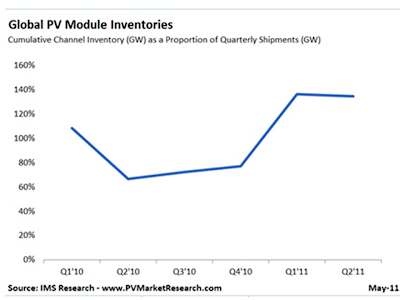 IMS Research estimates that almost 8 GW of modules are currently shipped by suppliers, but have yet to be installed and connected to the grid…"
[Sam Wilkinson, PV research analyst, IMS Research:] "Throughout 2010, when all products were moving quickly through the supply chain, channel inventory typically stood at four to five GW; which is roughly equivalent to one quarter's production…[A] module will take around three months to be shipped, transported and make its way through distribution channels before being installed, so this figure appears reasonable…Many in the industry consider today's inventory level to be shocking…[but it is] an increase of only around three to four GW over 'normal' levels." "In addition to the large channel inventory of modules, supplier inventory has also grown quickly in early 2011; most suppliers are reporting that year-to-date production has far exceeded shipments. 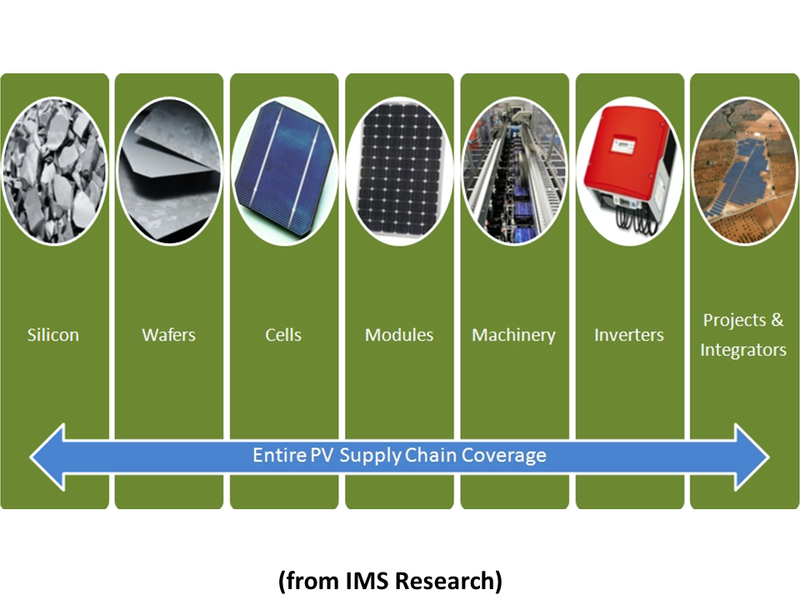 The resulting increase in modules held in stock by suppliers has taken the total PV module inventory over the 10 GW mark…[IMS Research] predicts that further declines in average PV module prices will lead to a strong recovery in the PV market, in particular, led by growth in Germany and the U.S. High inventory levels are expected to begin to be corrected in the third quarter." "The Danish company has spent over 12 years and approximately US$12 million to develop Poseidon, and data from a two-year, offshore, grid-connected test confirms the platform delivers increased stability and energy conversion efficiency to produce predictable, forecastable and dispatchable production which may reduce the problems of intermittency and approach base load consistency." 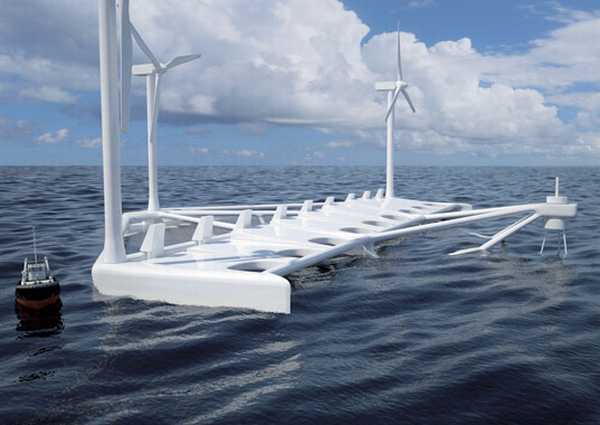 "The waves off Denmark are ideal for testing, and Floating Power Plant matured the technology during at sea operations. For its next step, the Danes sought an American partner specifically in the Pacific Northwest, where optimal wave conditions, electrical grid availability, preparatory work by the Oregon Innovation Council and Oregon Wave Energy Trust, a cluster of marine universities (including Oregon State University), port infrastructure and the presence of heavy industry offer a favorable climate for commercializing the technology." 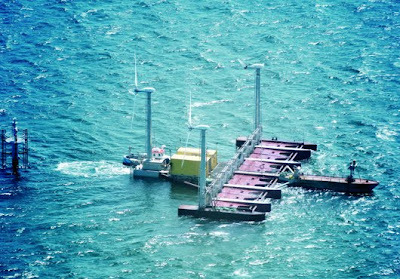 "Floating Power Plant (FPP) was incorporated in 2004 with a goal of developing renewable hybrid plants using wave & wind energy…[and] owns and holds the rights to the technology…In 2008 FPP launched a 37 meter test- and demonstration plant at an open sea test site in the Southern part of Denmark…[It] has been in operation for two years…"
Australia’s appetite for solar: Can CSP compete Down Under? 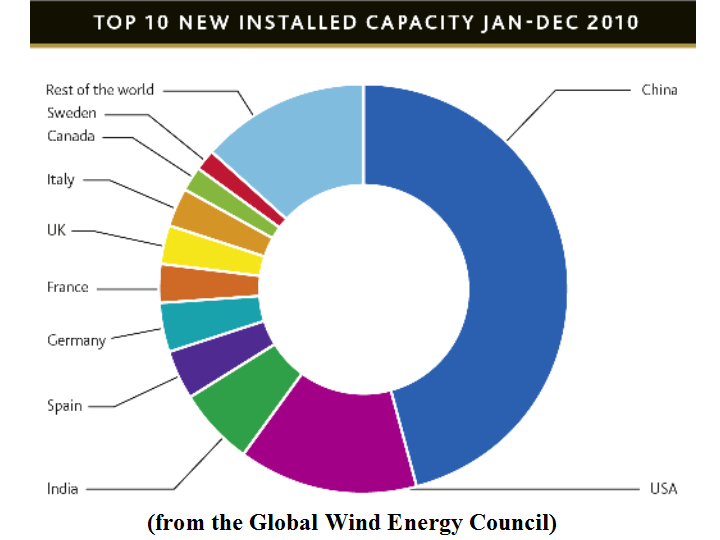 "…In January this year, the Large-scale Renewable Energy Target (LRET)…[began covering] large-scale renewable energy projects including commercial solar, geothermal, and wind…[It] is expected to deliver the majority (around 41,000 GWh) of the 2020 target of 20% of electricity generated by renewable energy sources…[D]espite the country’s vast land and solar resource, a mere 1GW is likely to be supplied by solar thermal energy…The government has also pledged funding [to roughly AU$40M ]to stimulate R&D and accelerate deployment of renewables…"
[Mark Twidell, Executive Director, Australian Solar Institute:] "…The primary issue for CSP is that the cost is significantly higher than wind energy, which is the renewable energy price setter…People often cite the advantage that CSP provides inbuilt energy storage and can generate 24/7 into the night, however, from a market perspective off peak nighttime electricity – often called baseload - is the lowest priced electricity, traditionally supplied by low cost coal generation…Today the market generally does not reward renewable energy that can offer firm capacity…"
[Mark Twidell, Executive Director, Australian Solar Institute:] "…Parabolic trough technology has been demonstrated and, as such, is considered to be bankable but is typically higher cost than wind and, arguably, other solar technologies…Power Tower and to some extent Fresnel and Dish technologies, which offer cost advantages, have not yet been demonstrated at the megawatt scale over an extended period, so it is difficult to get private sector debt and equity financing for these projects. There is a need, globally, for the finance sector to build confidence through proven operational experience with these technologies…[The Spanish government] is prepared to pay a high cost for electricity…[and] is allowing financial risk to be reduced for project financiers and allowing new technology to be proven and become 'bankable.'" 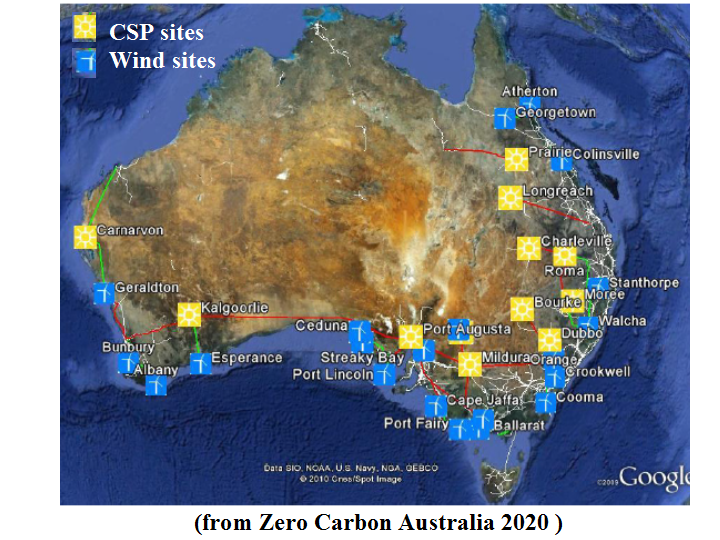 [Mark Twidell, Executive Director, Australian Solar Institute:] "The big challenge for CSP is to bring the cost down. The best way to [bring the cost down] is on large engineering projects, and by building a learning curve of ‘do-learn-do’…With hybrid CSP it is possible to lower the capital cost and construction and planning time as you don’t need to cover the grid connection and turbine cost. 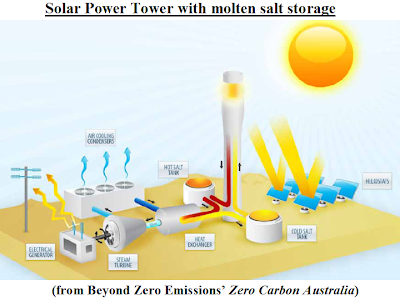 In this way you can develop experience in deploying what is different: the actual conversion of solar to heat, rather than heat to electricity, (which is something that has been done for a century using traditional coal and gas generation in other industries)…Looking at the long-run requirement, the move to a standalone CSP will come. This will be helped by having available low-cost proven solar-related components…"
[Mark Twidell, Executive Director, Australian Solar Institute:] "I would not say that fossil fuel subsidies are hampering the roll out of renewables. Technology has to be available at a cost that the financial community will finance. CSP needs to be cost competitive with wind…That said there is no doubt that a carbon price (if introduced) would send a clear signal to investors in CSP. Renewable energies are more competitive when external costs are factored in to fossil fuel prices. A long term market mechanism to price carbon would reward investors who were successful in developing viable CSP technology…"
"…Germany's first commercial offshore wind farm is now fully operational…EnBW Energie Baden-Württemberg AG commissioned the project, which consists of 21 Siemens wind turbines, each with a capacity of 2.3 megawatts (MW) and a rotor diameter of 93 meters. "The EnBW Baltic 1 wind farm will supply more than 50,000 German households with clean electricity. Siemens Energy constructed the facility in an area covering about seven square kilometers in the Baltic Sea…Commissioning of this wind farm is a major milestone on the way to creating sustainable power supply for Germany." "Electricity from offshore wind power plants is soon expected to make a major contribution toward ecofriendly power supply in Germany, just as in other countries like the UK. Excellent wind conditions with high average wind speeds open up tremendous potential for the use of wind energy generated at sea…By 2030, wind farms with total capacity between 20,000 and 25,000 MW will be operating off Germany's coasts…"
"Siemens will also build the EnBW Baltic 2 offshore wind farm (formerly known as Kriegers Flak)…It will have a total of 80 wind turbines, each with a capacity of 3.6 MW and a rotor diameter of 120 meters. Baltic 2 is slated for connection to the grid in 2013, and will supply about 340,000 households with clean electricity. "To date, Siemens has already received orders for five offshore wind power plants in German waters. 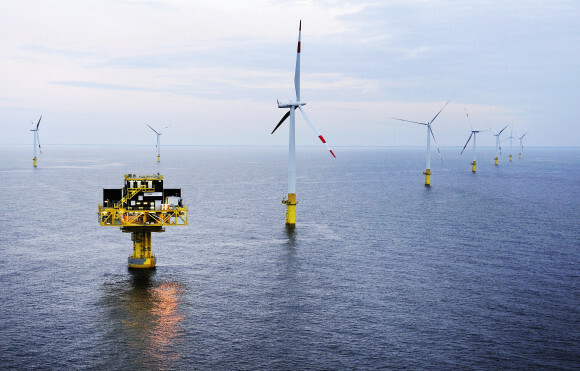 In addition to the contracts for EnBW Baltic 1 (48.3 MW), EnBW Baltic 2 (288 MW), Borkum Riffgat (108 MW), and DanTysk (288 MW), Siemens also received an order in February 2011 to build a German offshore farm Borkum Riffgrund 1 (320 MW). Over the last 20 years, Siemens has successfully installed more than 600 wind turbines with a combined capacity of more than 1800 MW in European waters…[T]hey have been reliably producing ecofriendly electricity. Siemens has additional offshore projects with a total capacity of about 3600 MW in its order books…"
'Living in Denial': Why Those of Us Who Believe the Science on Climate Change Still Do Nothing About It; Kari Marie Norgaard's new book examines why those who know about climate change fail to act on that knowledge. 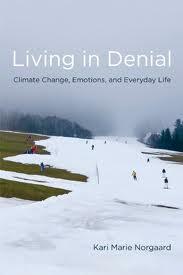 "…Kari Marie Norgaard’s Living in Denial…is not a book about people who reject the basic science of climate change…This is a book about many of us, and how we to varying degrees live in denial. Although focusing on a small rural community in Norway, Norgaard sheds light on how people systematically interact in ways that serve to downplay or ignore climate change, and avoid the unsettling emotions it raises. 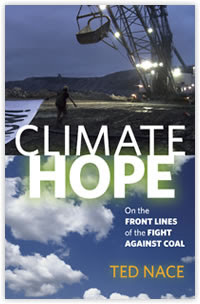 "In the Introduction, Norgaard says she is looking at climate change to build a model of socially organized denial, where denial is not just an individual, psychological process, but one that occurs through social interaction…[S]he means Stanley Cohen’s three varieties of denial: literal, interpretive, and implicatory. Literal is outright dismissal of information (i.e. 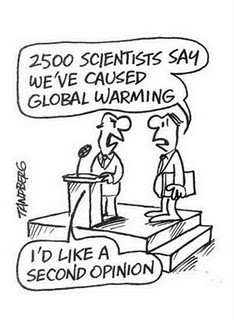 climate change deniers). Interpretive means reinterpretation of information (perhaps thinking climate change is natural, or will not be that bad)." "Implicatory is Norgaard’s main focus…[T]he information is not rejected but the psychological, political, or moral implications are not followed. This is the heart of the book… [Norgaard asks] why so many who accept the science don’t act, and how this inaction becomes a cultural norm…[She] explores the topic of social denial through interviews and ethnography in Bygdaby, Norway, from 2000-1. Bygdaby is a small rural community of about 14,000 people, with many farms and a strong sense of tradition, yet also firm roots to the modern world, including the fact that 34% of Norway’s national revenues came from petroleum in 2008." "…Norgaard’s work indirectly raises the question of how and why people become active and push for social change…[A] recent Yale study found significant differences in how groupings of people respond to climate change, suggesting more variation between individuals than Living in Denial explores…But Norgaard’s main point is showing how a group of well-meaning people can be both aware of climate change and not addressing the problem – how they interact in ways that push climate change out of the range of full attention and action. 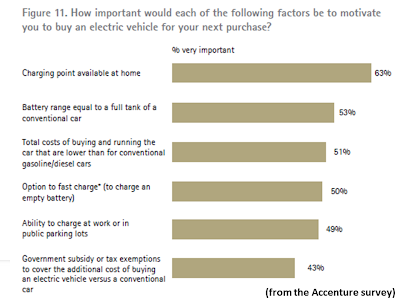 In that way, it speaks to many of us…"
"…[Plug-in electric vehicles; Changing perceptions, hedging bets from Accenture…a study of over 7,000 people in 13 countries…found that 60% of consumers would consider buying a PEV for their next car purchase, and 68% would probably or certainly do so within the next three years. Respondents in China are by far the most enthusiastic, with 96% probably or certainly considering a purchase in the next three years. "Consumers' preferences for charging PEVs, however, could challenge utilities and charging-service providers by increasing [the cost and complexity of managing the electricity grid and charging infrastructure and increase] grid congestion and peak-time electricity demand." "Two thirds (67%) of consumers are not willing to let charge-point operators limit when consumers can charge their PEVs, and 20% would only accept limits if they fell within time periods they had chosen. 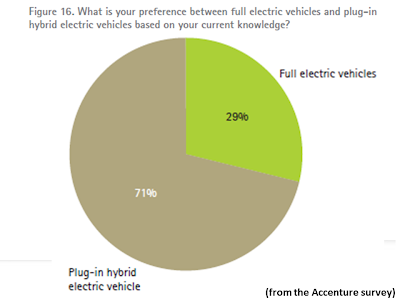 This would reduce the scope to manage electricity demand and avoid grid congestion…In addition, 62% of the respondents said they would reject battery swapping, where empty batteries are quickly replaced at service stations for fully charged ones. Instead, they would prefer to plug in their car to recharge the battery. This could limit the opportunity for charging during off-peak hours, when battery swapping companies would most likely refuel batteries. 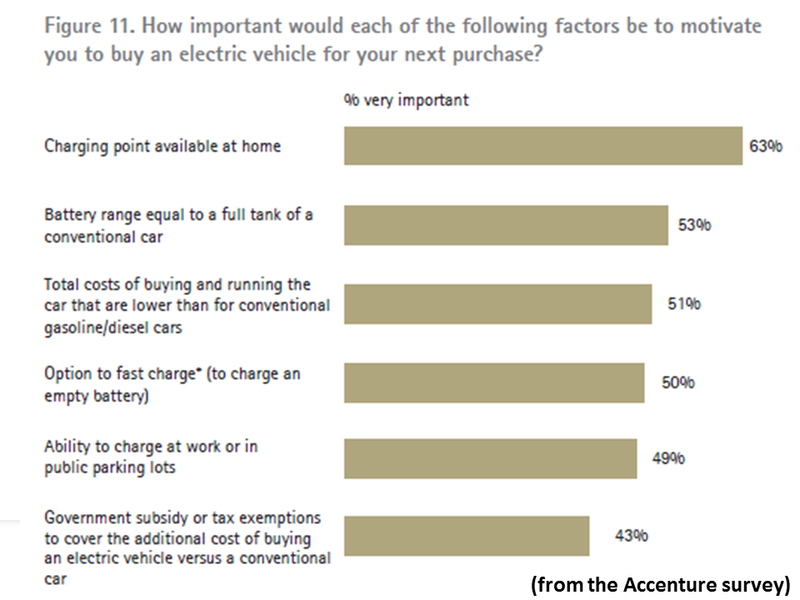 "Finally, 55% of respondents would only plug in their PEV when they need to charge it, rather than whenever they park. This behavior could result in less-predictable charging patterns and could reduce the demand for public charging infrastructure…Consumers would also need more supportive charging infrastructure in order to adopt fully electric PEVs. Only 29% of car drivers would buy fully electric PEVs, and 71% would prefer plug-in hybrid EVs (PHEVs), which run on gasoline or diesel once the battery runs low…"
"…[S]uggested for utilities…Reach consumers through commercial alliances with automotive distributors… Optimize infrastructure through collaboration with distribution network operators (DNOs)…[and invest] in smart charging… Engage consumers through market segmentation. Target customer groups…"
"…[G]eothermal energy involves no fuel cost or commodity price risk…[It has] the highest base load power and capacity factors of any power source…[M]ore than half of the costs [are] for initial drilling. 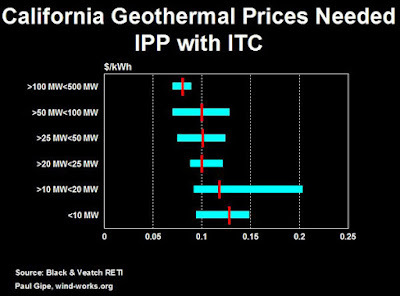 The typical breakeven point for a geothermal power plant in 2007 was approximately $0.054 per kWh, while the average cost of U.S. residential electricity was $0.12 per Kwh in 2009, leaving a healthy long-term profit margin." "The largest public geothermal company is Ormat Technologies (NYSE: ORA), with a market capitalization of over $1 billion and projected revenues of between $395 and $410 million in 2011. With more than 300 MW under construction and development, the company is well-positioned within the sector and continues to add new land projects to its portfolio to support future growth." "…[Due to a] recent drop in the geothermal sector, many stocks appear to be significantly undervalued…Nevada Geothermal’s current enterprise value currently stands at around $200 million, while its production is currently at 35-37 MW (net) or 46-48 MW (gross). This means that the market is valuing the company at $6/W installed, which is significantly less than the valuations seen in solar and wind. 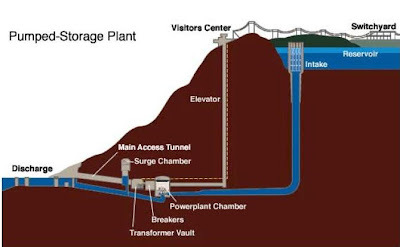 A more typical valuation… would represent the fact that geothermal plants are base load and can produce at 90% capacity…[The] low valuation of NGLPF’s assets put the company’s stock in the bargain bin for potential investors."